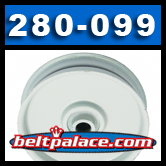 Home > Lawn and Garden > Lawn Mower Idler Pulleys > Idler Pulleys for your John Deere Mower > 280-099, FLAT IDLER PULLEY for JOHN DEERE AM103018 and others listed. 280-099 FLAT IDLER PULLEY, 3/8” Bore IDLER PULLEY for JOHN DEERE AM103018 which fits models JOHN DEERE 65, 66, 68, S80, S82 rear engine, 108, 112L,116, 130, 160, 170, 185 and 240. Also replaces: ALLIS CHALMERS 108386, ALLIS CHALMERS 2026357, CUB CADET 491395-R1, JOHN DEERE AM103018, JOHN DEERE AM41647, MTD 756-0515, SIMPLICITY 108386, SIMPLICITY 108386SM, SIMPLICITY 2108386, SIMPLICITY 2108386SM, TORO 6719, TROY BILT 1714742, TROY BILT 1724488. We offer 100% Secure Shopping!